The announcement by House Speaker Nancy Pelosi (D-Calif.) that she was opposed to impeaching the president unless something unexpected and mortally damaging to him arises, has almost unimaginably transformed her into a force for good sense in Congress. Maybe she thinks Special Counsel Robert Mueller will produce something the impeachers can run with and she is staking out a false position as a balanced and statesmanlike opponent of anything but impeachment for real crimes, to assist her in trying to get some Republican support to remove the president. More likely, she knows it's a hopeless case and is taking the high ground early, before Mueller throws in the towel for her. After prolonged and malicious scrutiny such as no president except Richard Nixon has ever faced (and in Nixon's case somebody did illegally enter the DNC office at the Watergate and somebody tried to obstruct justice), there is nothing to hang on President Trump, so the speaker has joined the James Comey school of sophistry. Comey said that to impeach and remove Trump was "letting the country off the hook," by which he meant that since there were no grounds to impeach or remove him, and the country voted him in, the country had to vote him out. That philosophical overview did not, of course, deter Comey from writing a probably false memo to himself, which instantly became government property, which he then illegally leaked to the New York Times—all, as he has proudly asserted, to bring the Mueller investigation into existence and down on the president's back even though he knew there was no reason to believe that Trump was guilty of anything. Comey is doing an unusually acrobatic star-turn, as Hillary Clinton blames her electoral defeat on Trump's "treason" as well as on being "shivved three times by Jim Comey." Never mind that two of the shiv attacks were exonerations and one of those was probably Comey's illegal acquiescence in Clinton's criminal behavior. Comey didn't seek the impeachment of the president, merely that he be mercilessly tormented with a phony investigation established because of Comey's own illegal acts. But the point still is: we must not impeach and remove Trump because the country must stew in its own juice and pay the price of having elected him president. Jim Comey's tough love for the country—not the complete absence of a cause for impeachment—incidentally spares the president impeachment. At least Nancy Pelosi, as far as we know, has not committed crimes, and she too eschews impeachment, not because there is no evidence of the president having done anything impeachable, but because the process is so "divisive to the country" and this president "is not worth it." The clear implication is that he could be impeached, and may have done things that merit impeachment, but the president is too unimportant and doubtless afflicted by moral turpitude to be worth the bother of impeaching him. Two years apart and by different routes, the Democrats appear to have arrived at the end of this trail: to teach the country its lesson—give it a proper trip to the woodshed and punish it severely, Trump will be permitted to complete his term, and as our parents used to say, by the same token, because he is too insignificant to justify the level of controversy impeachment entails, the country can be spared that process. Spurious, pompous, and mendacious casuistry though this is, within this retreat there are some important consequences. Pelosi has effectively acknowledged that even though for two years the country had an emasculated attorney general who immediately after being confirmed with a heavy laying on of the Republican whip in the Senate, recused from a lethal and legally unfounded challenge to the president's legitimacy, and even with fanatically hostile media and rabidly antagonistic special counsel staff and practically unlimited time and powers, nothing could be found to discommode this president seriously. There are many predecessors in that great office of whom the same could not be said. And the speaker has pulled the rug out from under the succeeding chapter in the hastily cobbled together second round of the national sport and parlor-game: "Let's Torment the President."' Representatives Jerrold Nadler (D-N.Y.) and Adam Schiff (D-Calif.), chairmen of the House judiciary and intelligence committees, have said the word "impeachment" or a derivative of it in every other sentence they have publicly uttered since Election Day 2016. Nadler has produced the distinctive constitutional interpretation that the president's frequent references to the Mueller inquiry as a "witch hunt," despite the fact that Trump has been fully cooperative with it, constitutes obstruction of justice, though Nadler, in his suave nonpartisan professionalism allows that though a crime, this form of obstruction may not meet the criteria for the "high crimes" required by the Constitution for removal of a federal officeholder. This is a variant on the Comey and Pelosi weaselfest. The president's exercise of his First Amendment right to free speech in reference to an improperly constituted and partisanly directed investigation that has torn his administration apart and fed the Democratic media defamation factory for two years is a crime, but possibly not on a scale sufficient to justify removal from office. I am very conversant with the relevant works of Franz Kafka, George Orwell, and Arthur Koestler, and none of them had the morbid or maladjusted imagination to conceive of so implausible an official stance. The closest I can think of was Kafka's infamous category of "nameless crimes." Schiff merely repeats endlessly that he has "clear" and "strong" prima facie evidence of collusion between the Trump campaign and Russia, but never reveals it. 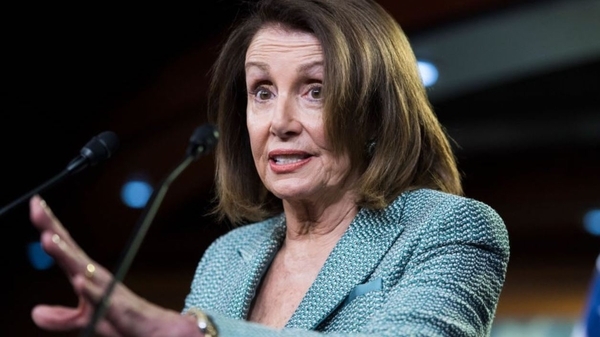 Speaker Pelosi has cut the ground out from under the Nadler-Schiff blizzard of subpoenas for 81 witnesses and herniating masses of documents. There is no ground for impeachment; this cannot possibly lead anywhere legislatively. It is just a squalid, gasping effort to keep the fiction of Trump's legally suspect election going and producing more fake news for the Democratic media propaganda machine. It is one of life's pleasant surprises that Nancy Pelosi should be the agent of a benign shift in public discourse. She is obviously having trouble keeping some of her caucus within rational policy guidelines, and the anti-hate resolution was a fiasco that leaves the country wondering how much of the dog the tail comprises. But she has effectively told them that it is time to try to win the next presidential election and to stop trying to overturn the last one. It is one of the most ungraciously formulated retreats since the German army announced in 1942 that in Russia it was "advancing to the rear," but it is a welcome gleam of realism.